How to redirect WordPress 404 pages? Especially for the visitors of your site, 404 pages are a real disappointment, but even for the major search engines such as Google, these errors have a negative effect: They are damaging your rankings. 404 pages are always occurring on your WordPress website if the specified URL cannot be found. Redirecting these WordPress 404 pages is therefore an important step to prevent a negative impact on the search engines as well as on the visitors of your website. The BAVOKO SEO Tools plugin enables you to easily fix WordPress 404 errors and also to completely avoid them in the future by automatically redirecting your WordPress 404 pages via 301. With these search engine friendly 301 redirects of your 404’s, the search engines are immediately informed that your page will be permanently found under a new URL. In the plugin, go to the “Tools” section and navigate to the “Redirect Manager” tab. Open the line “404 to 301 Settings” by clicking the arrow on the right. You now have several options to choose where you want to redirect your WordPress 404 pages to. Choose between “Domain Home URL”, “Home URL”, “Custom URL” or “Parent Directory” for your automatic 404 error redirects. To save your changes, finally click on the “Save” button. In order to automatically redirect WordPress 404 pages via 301, set a checkmark in “Activate 404 to 301”. This will allow BAVOKO SEO Tools to automatically fix your WordPress 404 errors. Select the “Domain Home URL” option from the drop-down menu to redirect your WordPress 404 pages to your home page. If you have installed WordPress in a directory or via a subdomain, the “Home URL” option will redirect all WordPress 404 pages to the respective subdomain or directory page (subdomain.domain.com/directory). Otherwise the 404 error pages will be redirected to your homepage by 301 – as with the domain Home URL. In order to redirect your WordPress 404 pages to a certain page, you can simply enter an individual address in the “Custom URL” field, to which the automatic 301 redirects will then lead. 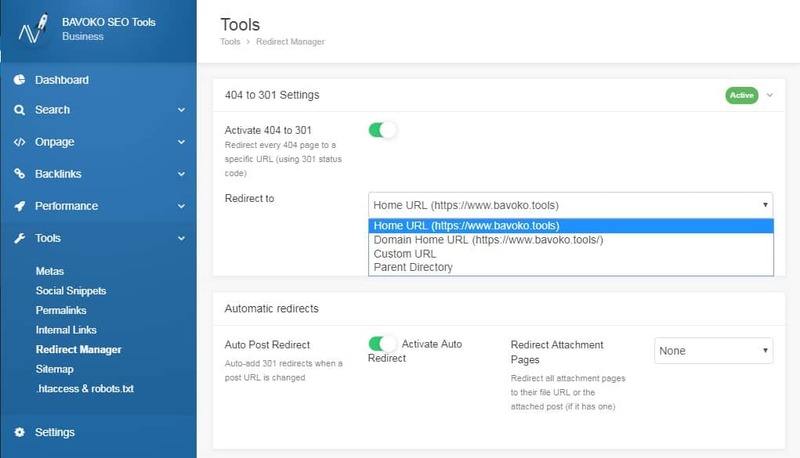 In addition to the automatic 301 redirects for 404 pages in WordPress, BAVOKO SEO Tools also offers you numerous other options to automatically redirect your WordPress permalinks when changes are made in the URL slug, the Post Type URL or the Category Base. Here you can learn more about the SEO Permalink settings and automatic redirects in BAVOKO SEO Tools. Our WordPress SEO plugin provides you with an intuitive and optimized user interface that allows you to fix your WordPress 404 errors without having to edit the .htaccess file.